Positive ION: This Saturday in Downtown Mount Clemens! The festivities go on all day long! They start at 8:00am, when the Mount Clemens Farmers Market begins their annual Pumpkin Party... then Turning Point starts their Trunk or Treat event at noon. 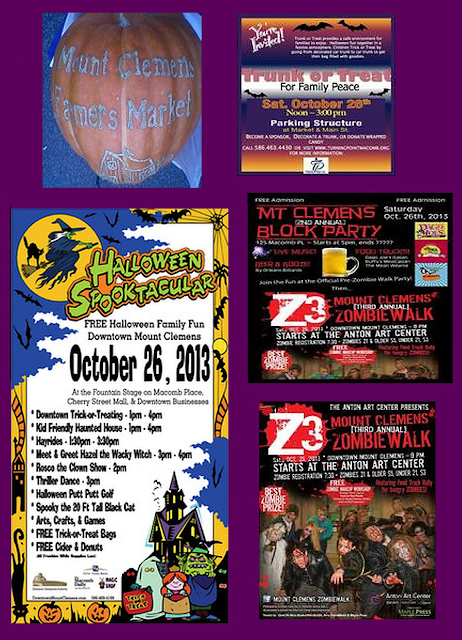 Of course, there's the multi-activity kid's event, The 6th Annual Halloween Spooktacular, followed by the 2nd Annual Block Party, and it winds up with the 3rd Annual Zombie Walk! You want details, you say? We got 'em! They can be had by clicking right here: http://ymlp.com/zR3g3z! Also... the PYRO Art Glass Studio has created even more beautiful glass pumpkins, so stop in and have a look! If you want to know even more of what is going on around the area, check out the Positive ION RebelMouse page (or peek at it here, just below the current blogpost)!